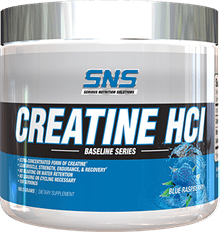 SNS Creatine HCl is a winner - see our review below! Robert and CJ gave it a go, and got WAY more than they bargained for - what a great deal this is on a flavored creatine! Creatine is a staple in many athletes daily routine. Creatine Monohydrate being the most popular. But there are many advantages of using Creatine HCL including better solubility, bioavailability, increased plasma uptake, and NO bloating or cramping. You can take a small micro-dose of Creatine HCl versus taking a massive dose of Creatine Monohydrate because it is more water soluble. SNS Creatine HCL can be cost effectively used by those looking for an Ultra-Concentrated form of Creatine. Supports Lean Muscle & Strength! Promotes Endurance & Enhanced Recovery! No Bloating or Fluid Retention! Creatine is a staple in many athletes daily routine.Creatine is a staple in many athletes daily routine.